Bali has become the go-to place for bridal showers. Even our group chose this destination for the many good reviews about hen parties in Bali. Last August 2018, almost two month's before Lady's wedding, we, some of the bridesmaids and the bride-to-be went to Bali for Lady's bachelorette party. There were supposed to be 10 of us, but two friends were not able to make it on the last minute. Anyway, we had fun. It's definitely one hell of a weekend! We had a very nice villa (Bali Bliss) in Seminyak and we had nice photos because of Sweet Escape, which gave us a big discount. We also had a really cool and kind driver, who took us to many beautiful places, such as the Melasti Beach in Uluwatu and Uma Pakel in Ubud. I feel really lucky to be able to spend time with these amazing people, most especially the forex guru and philanthropist, Greg Secker, on a weekend filled with a lot of interesting activities. We flew to Iloilo and stayed at Richmonde Hotel, then we flew to Lemery via a helicopter. We visited the Greg Secker Foundation Village, and met a lot of nice people there. After three days and two nights in Iloilo, we flew back to Manila. We were able to volunteer at the medical mission of Starkey Hearing Foundation, and I was able to meet Bill Austin, the founder of Starkey Technologies, the top manufacturer of hearing aids in the US and 6th globally. Oh, we actually rode the chopper from BGC to QC and back. So while in QC, we also went toy and book shopping at Trinoma, which we donated to the children of the House of Refuge. Haven't posted in a while. Sharing with you guys snippets of my US (West Coast) trip last December 2017 to January 2018. It was actually my first time in the US. More fun than the places I went to was the company of family and long-time friends I haven't seen for the longest time. I haven't posted for a while and I realized I haven't also posted about my 4-day trip in Taipei, Taiwan last June. That was actually one of my cheapest out of the country trips wherein I only spent around Php 25,000 inclusive of airfare, AirBnb accommodation, and pocket money. To sum up our activities, they're basically about temples, shrines, and night markets. Taipei is nice and I love their food, but it is not one of the places I'll keep coming back to. -sakura aka cherry blossoms everywhere!!! It's one of my most relaxing and rewarding trips in Japan. I love travelling alone and visiting family and friends. It's really therapeutic! The Torque EGO Phab #G+ is Here! 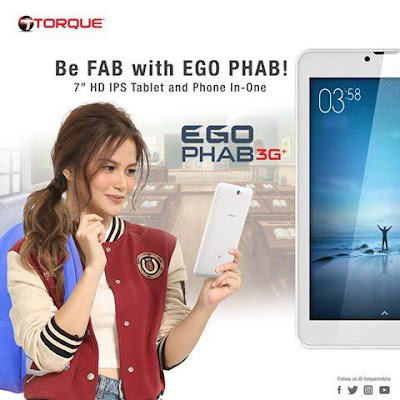 Torque Mobile has just released the EGO Phab 3G+, an entry-level tablet with a 7-inch screen, 1.2 GHz quad core processor, and 1 GB RAM. The Torque EGO Phab 3G+ also features 8 GB of expandable storage, 2,500 mAh of battery, 5 MP main camera, 2 MP front facing camera, 3G connectivity, and dual SIM card slots. Anyway, the Torque EGO Phab 3G+ is now available at all Torque Mobile concept stores and kiosks nationwide. It is also available via www.one2shop.com. Sharing with you guys my Coldplay experience in Tokyo, Japan last April 19. I'm fond of watching concerts, but I'm not the type who would really spend for it. I am used to getting free tickets during concerts but there's only one concert I promised to spend on, and that's a Coldplay concert. A few years back, I planned about going to the Fuji Rock Music Festival in Japan 'cause they're headliner that time was Coldplay. Unfortunately, my visa expired so I had to go back to the Philippines even before the music festival. So when I heard about Coldplay's announcement of their concert in the Philippines, I promised myself that I would go no matter how much it would cost me. Then came the day of ticket release. I kind of hesitated because I thought the tickets were overpriced so I didn't purchase anymore, but I prayed to get either free tickets or at least, cheaper tickets. But I found out about the ticket prices in their concerts in other Asian countries. I got really enticed by the prices in Singapore, Seoul, and Tokyo. Unfortunately, it was so hard to secure tickets for the Singapore leg; then flight tickets to Seoul (even on budget airlines) were really high. I was planning to watch the Japan leg but decided to skip the Coldplay concert for my Eurotrip on the same month. It must be a sign that my Schengen visa processing got really delayed at the Greek Embassy, and my aunt offered to pay my airfare so I could visit her in Japan. So there, I booked a ticket to Japan, still without plans of watching Coldplay. I have a friends who recently moved to Japan and she's interested of watching the concert so she convinced me to go. I posted a Facebook status looking for tickets and I got a lot of replies. We were supposed to get S-Reserve tickets but a better offer came in. A Japan-based lady sold us 2 S-Reserve tickets which were priced 21,000 yen from 18,000 yen. It's more expensive but I understood why she put a markup on that. She was so nice so we got convinced to buy the tickets. We met up in Tokyo a week before the concert and my friend and I were so thankful that we found her! A day before the concert, I had to travel to Yokohama from Nagano so I could stay at my friend's place. The next day, I travelled for 45mins from Yokohama to Tokyo Dome City to catch Coldplay's concert. Since my friend was coming from work, I spent time waiting for her with my other friends who were also there to watch the concert, but they got VIP tickets. The concert started on time and it was the best concert I've ever experienced! Plus I was happy that I watched it in Japan because the Japanese were very particular in the quality of sound and lighting so I was sure that technical problems would be very minimal or would not even happen. And they were very organized! Even after the concert, the exit of the audience were done by row. Anyway, my friend and I really enjoyed the concert. We were very thankful that we pushed for it. It was super worth it! We missed Pat Santos, who skipped the Philippine Fashion Week Holiday 2016. But he's back in the runway to showcase his Spring/Summer 2017 collection. 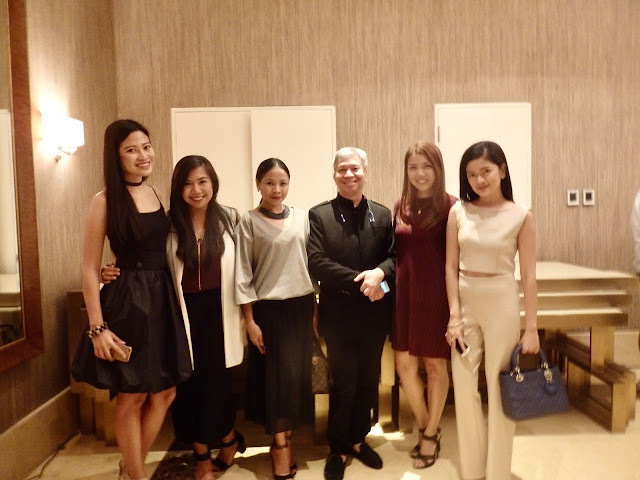 On November 20, we went to Discovery Primea to see Pat Santos' new collection, which took him eight months to complete. 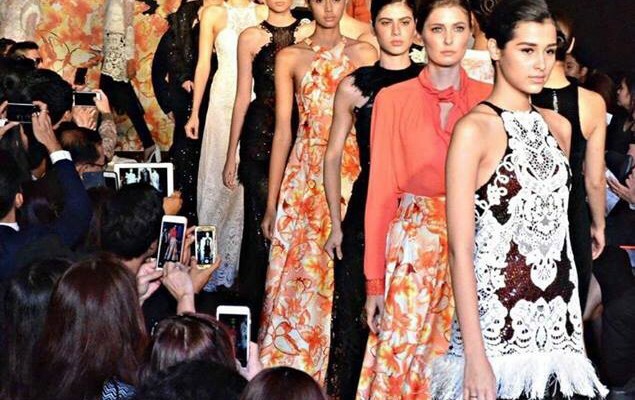 Entitled, "Romancing with the Butterflies", Pat Santos' Spring/Summer 2017 collection was inspired by the butterflies and romance. He wanted his muses to feel that they truly are a woman. Pat is usually inspired by the elements of nature such as oceans, birds, butterflies, and flowers. His previous S/S collection was inspired by the oceans. His clothes were worn on the runway by local and foreign models. Having foreign muses gives his collection a more global look, just the way he wanted it. 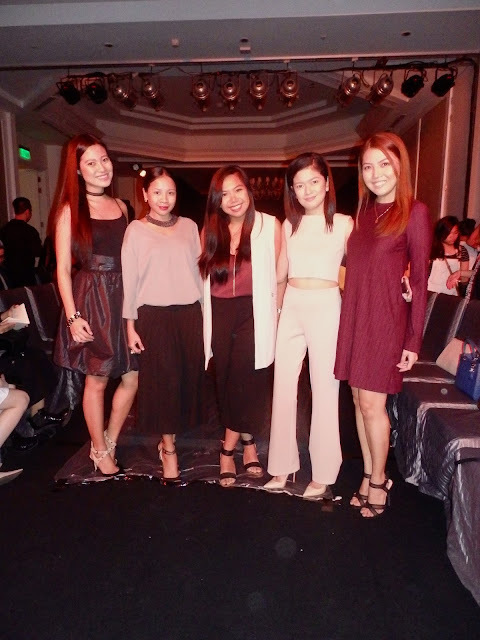 Miss Earth 2015 Angelia Ong, whom we've seen wearing Pat Santos' dresses often was also part of his show. It seems like we'll be seeing more of Pat Santos creations on Angelia as she was described by her stylist, Janno Novenario, as someone who embodies a Pat Santos woman. how about black and white for summer? What exactly is a Pat Santos Woman? Innovative. Consistent. Very Woman. Pat Santos creations showcase simplicity and class, and are not too busy. Dresses that have too many things going on are so outdated that's why Pat chose to have simple yet modern and wearable designs. However, simplicity doesn't mean he would have less attention to detail. The dresses we saw on the runway may look simple but they're actually intricately put together as each dress would have 3 to 5 different fabrics and they are still light. What's next for Pat Santos? He's planning to have a bridal gala wherein he would create something very modern, very "now", wearable, and affordable. And of course, we're all excited for that! My apologies to Pat for posting this super late. Got a last minute invite to watch Macklemore and Ryan Lewis at the Palace Pool Club and of course, I didn't say no. I wasn't able to watch them on their first time in Manila in 2014 because I was supposed to watch them in Kuala Lumpur during the 3rd day of the Future Music Festival Asia (FMFA), which got cancelled. Then their performance in Manila was on the following day but we were still in KL. Anyway, thanks to Solar Entertainment for the invite. It was a short yet fun concert. The best part was when they jumped into the pool beside us right after their performance. How cool was that? I had a perfect view to tape them. Watch this video to see. PS. Ryan Lewis is a hottie!